This is my next aged Riesling-bottle, this time from the very very good 1976 vintage. It’s an eBay bottle from some quite totally unknown estate in the Mosel region, since I striclty found nothing about it on the net. Therefore, and also because lots of people don’t appreciate aged white, I got it for very little money. It is an Auslese which is the third highest Prädikat and comes before the well-known sweet wine Prädikate such as Trockenbeerenauslese or Eiswein. Auslese means that only the best grapes in the vineyard are selected and the mustweight should be at least 95 Oechsle degrees. Most generally a Auslese comes with relatively low alcohol and rather high residual sugar. 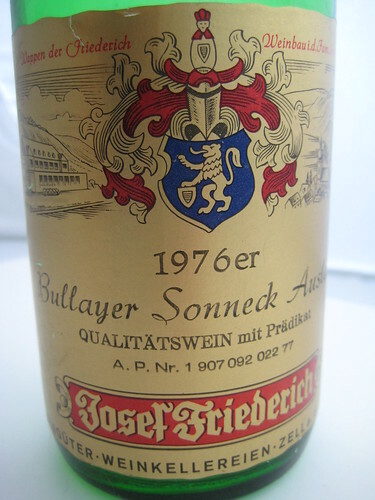 Nowadays the trend is that there are more and more “trockene Auslesen” being made, which means dry Auslesen, but for a 1970’s wine one can almost be sure it is a nondry wine. We had it at the end of a dinner as a final bottle without any food accompanying it. The wine had golden colour with an amber hue. In the nose some Edelfirne of course reminding wax and honey as well as some orange zest. On the palate it was at first striking how low the alcohol level was. There was no indication on the label about the alcohol (at that time it wasn’t mandatory) but it must have already been low and by now it had nearly completely disappeared. My guess would be something like 4 to 6 %, and it was such that one could have the impression to taste grapejuice actually. Nevertheless it had a long finish with a fresh minty note. All in all the wine was still in very good shape regarding oxidation and cork, but lacked a bit of structure as it seemed a bit watery sometimes and of course was short of alcohol. I think it would be best drunk as a refreshing and light starter drink before a dinner.